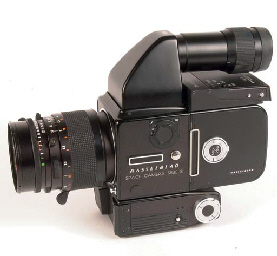 Photography guru Ken Rockwell spotted the PDF manual for the NASA version of Hasselblad dream camera. Free at that link! With all the Soviet-era spacecraft and accessories becoming available on eBay — cheap — you budding space explorers may find this very helpful. He may be right (he is, most of the time! ), anyway this manual is somehow amazing and funny too! Camera instructions usually include sample pictures of people on the seaside, smiling kids, beautiful girl… this Hasselblad manual features sample pictures of the Space Shuttle dock bay, tail and earth as seen from low orbit! Hasselbald Space Camera manual, for free! This entry was posted in Photo, Photography, Space and tagged Hasselblad, Photography, Space, Space camera, Space Shuttle. Bookmark the permalink.